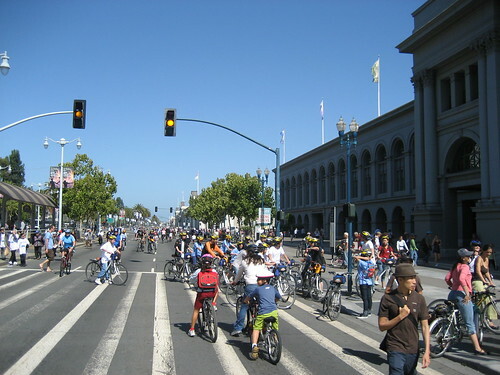 Here it is, in case you didn’t make it out to Sunday Streets SF. 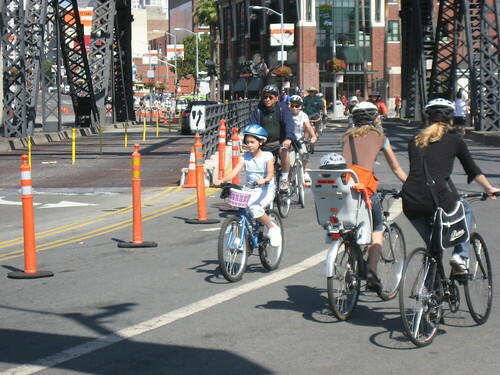 This is what a city with fewer cars can look like. Less cars, more life. Sunday Streets SF: great day or greatest day? People report having fun. Merchants report business up. Families show up in droves. Smiles all around. About 10,000 people came out to play. The only complaints heard (other then problems with the rail road tracks on Illinois which was solved for the second Sunday) were: why didn’t it start earlier then 9am? And, Why didn’t it go later then 1 pm? And an occasional Why wasn’t the route longer? and Why don’t we do this every Sunday? 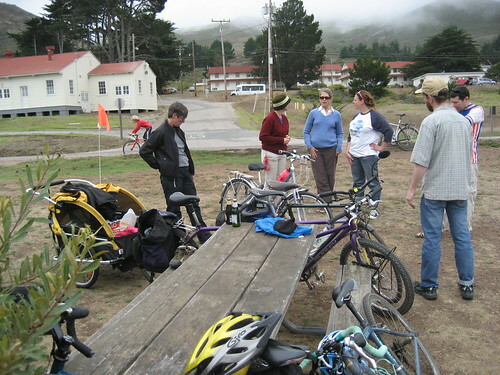 If you live in SF e-mail your Supervisor and tell them how much you want to see it continue, and e-mail Mayor Newsom, gavin.newsom (at) sfgov.org without whom we would not have had these two events and thank him, and ask for Sunday Streets to continue. What is the best part of a party? Getting there or being there? If you pedal to the party with a bunch of your friends, it can be both. 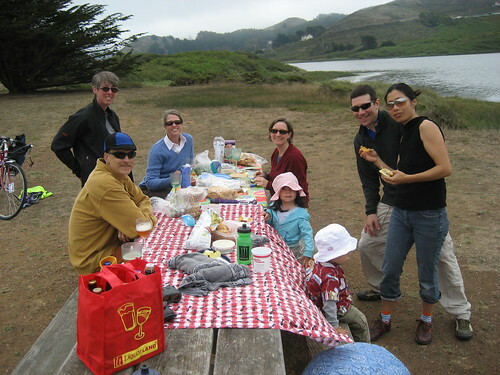 On the Iron Horse Trail, heading to a birthday picnic. 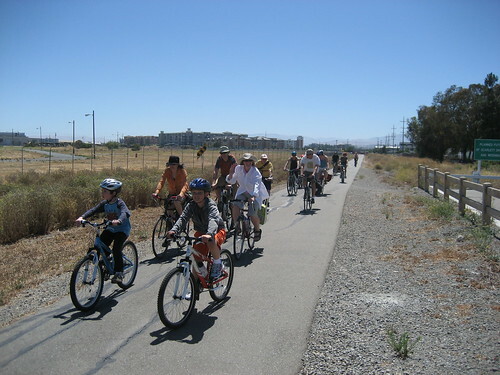 No one is late because of snarled traffic when you pedal to the party. And you get to check out any new bikes acquired by your cycling pals since the last time you saw them. Checking out the new bike. When the party is over you get to ride home with friends as the sun sinks into the fog. I commute by bike, my oldest brother does most of his commuting by bike, my father commuted by bike for decades, and my husband commutes by bike. I wish I had a photo of Dad on his bike commute in LA in the 70s, 80s or 90s. He was intrepid, continuing to commute despite several incidents with cars – including one scary one where a mentally unstable driver plowed into him deliberately (separated shoulder: acromio-clavicular separation – “Write that down”, Dad just said. 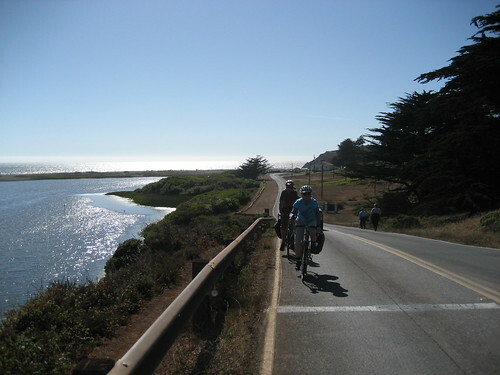 “Cyclists will recognize it; it’s a typical cyclist injury” ). He was sideswiped by a mail truck (broken hand), he slammed into the side of an Audi whose driver cut him off (bike totaled, Dad scraped and bruised), and yet, he kept pedaling. He didn’t ride all the way every day, but I’m sure it made such a positive difference in his life. Now 73, he just bought a new Trek bike to ride to the gym. Are my brother and I chips off the block? 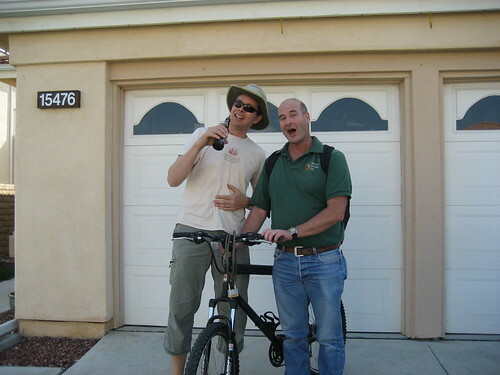 Growing up with a bike commuting father must have sunk in – and we are from very practical Yankee stock. No matter how cheap gas was it’s always cheaper to bike. All the studies say that it’s more hazardous to your health to not ride a bike then to ride a bike. So even if my Dad’s history of bike commuting “incidents” sounds dangerous to some – the proof is in the 73 year old who is in good health riding his bike to the gym. 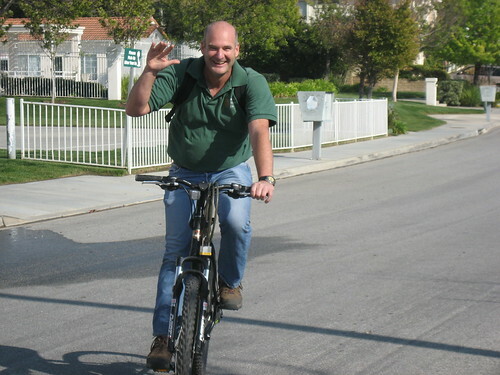 Unfortunately, he no longer feels safe riding on the roads and only rides on seperated bike paths. He feels his balance and reaction time are just not up to sharing space with cars and trucks. But he still rides. Ride on Dad. And thanks for being such a good role model. And why don’t I have photos of you on a bike? My two favorite bike commuters. space to SF streets and creates a novel, fun play space for all. with activities for all to enjoy. health, fitness, youth and family oriented organizations. Streets, then Come Out and Play! This morning I took the N Judah during the morning rush hour for the first time in about three or four months. Why? Why, do I chance it? The J Church I was heading for, based on Nextbus, was going out to the beach – turning into an outbound N, instead of going downtown. The next N was too full to get on, and there I was ten minutes later still only two blocks from home. Not on my bike pulling up to work, not on my bike cruising down Market Street – just standing and waiting for a streetcar. The box I had to take to the post office wasn’t that big, it would have fit on my rack with a bungee cord to hold it steady. But it seemed easier somehow, to take the box on the streetcar. Hah! If you’d rode, you’d be there now. Oh, how casually I brag about easy parking when going by bike. When someone at the grocery store comments on my bike trailer I say – “oh yes, and I get the best parking spots” meaning the parking meters right outside the door. But what about the frustrating moment when there are no parking meters? Or they are all full of bikes? 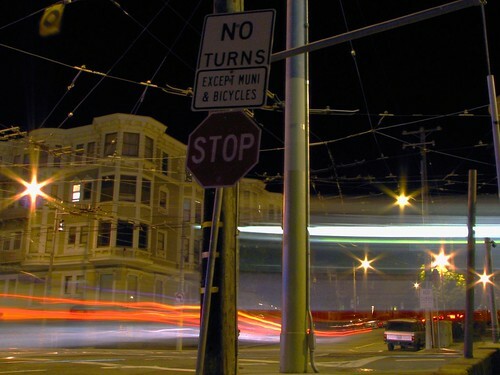 Or, you lock to a street sign at a party and come out to find yourself locked in – another bike overlapping yours. (I knew who it was, it was funny more then annoying.) I got spoiled with all the easy parking. Now with so many more bikes in the city sometimes parking can be tough. You learn. Check the poles for stability before you lock to them. Carry a cable and Krypto to increase your locking opportunities. This past weekend outside the Sloat Garden shop I locked to one of their wheelbarrows since there was no meter or pole on the entire block. I used my cable and looped it around the frame of the barrow and then locked to my bike. I wouldn’t do that for hours, but for a quick stop at the garden store it was fine. 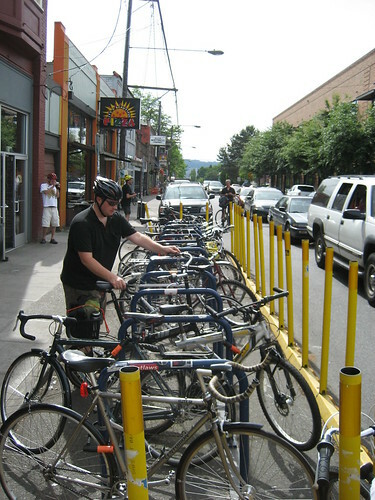 But what we need is more bike parking, on street, like we have outside the Main Library, or like this in Portland. Lock it up, plenty of room. If the streets weren’t full of traffic, think of all the things we could do in them. Last night I went to an unofficial street party on Lily Street. A big cross section of people (maybe a hundred) mingled outside on a lovely summer evening with friends and neighbours, food and music. I say unofficial because the street wasn’t specifically closed, but Lily is a quiet enough street that traffic wasn’t a problem – we just moved out of the way for the rare car that came by. Including the SFPD who drove the wrong way down the street, got out and looked around for a few minutes and then decided there wasn’t anything illegal enough going on to concern them. My band Cervantes is trying to release a CD at the end of the month. We’ve been working on recording, mixing, and the final step, mastering. To get our tracks mastered, we sent it over to Ken Lee Mastering in Oakland. We emailed him our final songs and I was assigned to pick up the CD he made for us on Friday. All the way in Oakland. Not walkable from BART. I needed to get out there somehow, on my own, during work hours. Solution? BART from Civic Center to MacArthur Station to CityCarShare Hybrid Rental for one hour. Back on BART, get off on Powell Street and catch the 31 Balboa back to my job in the Fillmore. All this without owning a car. Yes people, it’s possible. We went, we biked in the streets, we had fun. 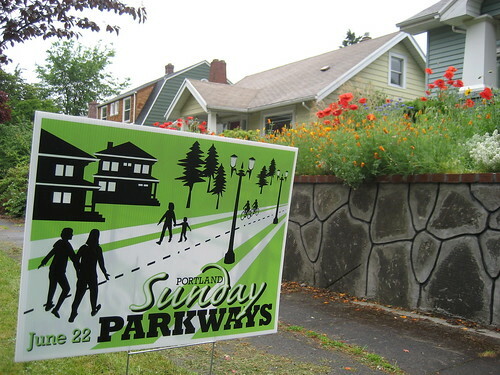 Portland had a 6 mile loop of streets closed to auto traffic last Sunday. Modeled on the Bogato Ciclovia it allowed walkers and skaters and joggers and cyclists to enjoy the streets without worrying about auto traffic. 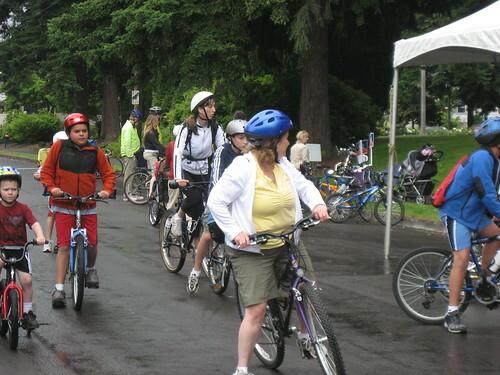 Sunday Parkways. This was not a race, there was no start or finish. If you were looking for a place to ride a bike fast this was not it. There were so many kids and interesting bikes, and joggers, and dog walkers and people in the neighborhoods who had set up parties in their gardens that all you wanted to do was ride slowly along, smiling at everyone, waving to people, taking in the sights, and enjoying the streets in a different way then ususal. Kids were able to actually go play in the streets. Local traffic was allowed in and out, but there were very few cars who needed to access the streets on a slightly rainy Sunday morning. It was wonderful. More please. Here please.